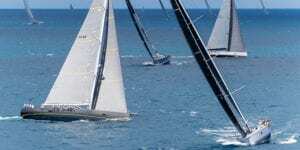 This year’s Loro Piana Caribbean Superyacht Regatta & Rendezvous was held from Friday March 10 – Monday March 13, 2017. A diverse fleet of 17 yachts raced at the Loro Piana Caribbean Superyacht Regatta and Rendezvous, the annual event based at the Yacht Club Costa Smeralda’s clubhouse in Virgin Gorda. During this top-level superyacht event two Southern Wind 82s, Grande Orazio and Ammonite, really showed the joys of sailing and sportsmanship. Ammonite is owned and raced by the Australian Marcus Blackmore, long a passionate sailor who has many Sydney Hobart Race under his belt. Launched in 2016, she made her regatta debut at the Loro Piana Superyacht Regatta in June, when she had just arrived from South Africa to the Med. Grand Orazio was launched in 2014 and has already chalked up victories in the Maxi Yacht Rolex Cup, the Loro Piana Superyacht Regatta and the Southern Wind Trophy. This time Grande Orazio’s owner Massimo Florio was not at the helm, replaced by another famous owner/helmsman: Pierluigi Loro Piana. It’s a true honour for us that Mr. Loro Piana, the man whose passion for sailing has been the catalyst for famous regattas, has chosen several times a Southern Wind yacht for his winter racing. 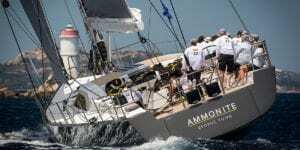 Both Ammonite and Grande Orazio arrived in the BVI ready for action. Both yachts boasted highly qualified profession crews. Will Oxley, Will Ryan (Olympic silver medal) and Rafael Trujillo were aboard Ammonite along with many other Aussie sailors who compete aboard TP52s, Finn and VOR yachts. “Amongst us all we have 80 Sydney/Hobart races under our belts,” joked owner Marcus Blackmore. Grande Orazio had a crew of some of the top names in Italian sailing aboard. The racing was truly spectacular. The daily courses were laid out along routes that took the fleet through some of the most beautiful scenery in the Caribbean and the weather couldn’t have been better. The most thrilling racing was in Class C where the two Southern Wind yachts were racing. Grande Orazio, when she wasn’t fighting off Ammonite’s attacks, was fully engaged by the Swan 90’ B5, and the three yachts kept spectators on the edges of their seats daily. Tacks and tactics kept the levels of suspense unusually high, especially considering that this was a superyacht regatta and safety regulations along with staggered starts usually keep the yachts in the fleet at a distance from each other. Grande Orazio concluded the event with a podium finish. After the racing was over, Ammonite’s owner was especially happy that just a few hours after the prize ceremony his yacht had already “changed her clothes” and was out of regatta mode, ready to head off with the owner and his guests for a tranquil cruise through the beautiful Caribbean islands. After being launched in South Africa, summering in the Med and wintering in the Caribbean, Ammonite will soon head for the Pacific where her owner is based.